Packing in some UK dates is a chore for busy artists on the back of the festival season. 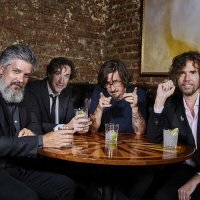 The Mountain Goats have managed to slot in two dates in London and Manchester (10th and 11th October respectively) between dates in the Netherlands and France. Hailing from North Carolina, USA, and due to embark on an extensive tour of the United States later in November, The Mountain Goats have released over twelve albums and a hundred songs under guise of frontman John Darnielle. Darnielle has been referred to as "America's best non-hip-hop lyricist" by New Yorker magazine and has collaborated with artists such as Kaki King as part of his project. Combining nasal vocals and guitar, and recordings on a shop-bought Hi-Fi, The Mountain Goats' quirk is experimental and quaint, and not to be missed! Tickets are on sale now at £12.50 each.